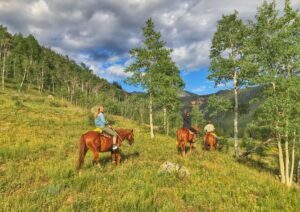 From June 21st through the last weekend in September, Piney River Ranch is more than just a quiet place to kick back in front of a spectacular view. In fact, we offer an array of activities at the ranch, on the water, and in the thousands of acres of backcountry that surrounds us. From canoeing on Piney Lake with the family, fly-fishing on the Piney River, or hiking to Piney Falls we’ve got an adventure for everybody. Visit here for a video tour.